Feb. 24 – Visit Elliot Chapel Day School Garden area to evaluate. Give them milkweed seeds to plant. April 18 – Elliot Chapel Day School – donate plants to them. July 23 – Eagle Scout Project help. Sept. 2nd – 6pm – Kirkwood Garden Club to visit. Nov. 18th – Elliot Chapel Day School – helped setup a cage for 6 new Monarch butterflies. Try Verbna bonareinsis – Lollipop- a smaller version – may reseed. I haven’t found a source for seed. At Mobot, it does not have mildew. http://anniesannuals.com/mailorder-info/ – has Lollipopo – expensive shipping.Wait until it gets warmer to ship. Try Agastache – Blue Boa. Doing well at Mobot. Try Sedum erythrostictum – Frost Morn – nice at Mobot. Try Michaelmas Daisy – Blue Lagoon – it’s supposed to be smaller. Mobot Link Here. Maltese cross was main WOW plant in the spring. 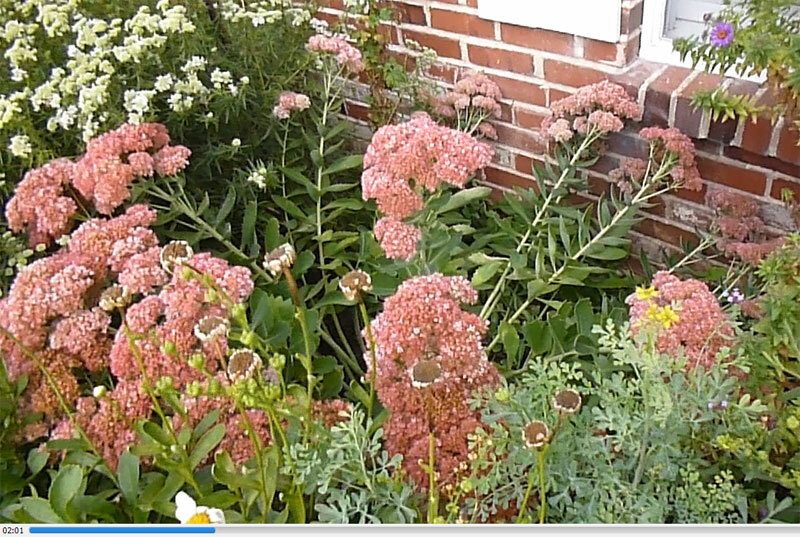 Take out most Autumn Joy sedum – it’s too big and floppy. Keep false nettle about 5′ from the edge in back. Cut back NE Aster in May, June and July 4th – then leave it alone? Try some experiments on this. Give it some room to grow. As I look at my mid-September garden I’m looking for ways to make it better next year. Here’s what I see. Take out Pearly Everlasting – add something in front of the Shasta Daisy. 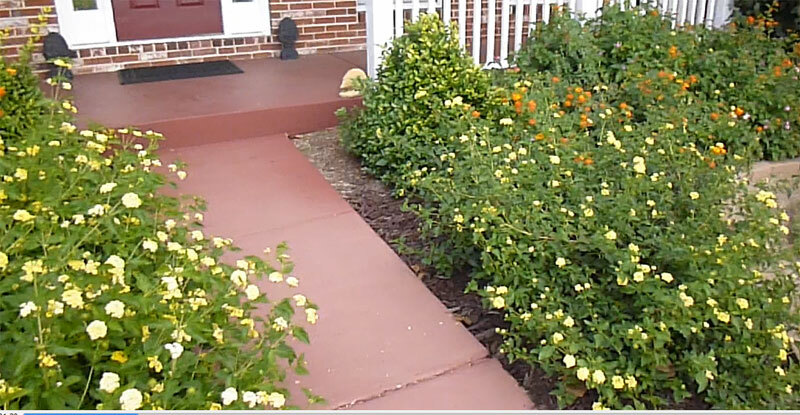 Lantana in the front is doing great. For some reason the area by the Viburnum is not doing as well as the other side. does it need more sun? My sedum all have a tendency to get tall and spread out. I’d like to find a variety that doesn’t fall over. Milkweed needs it own area by itself. 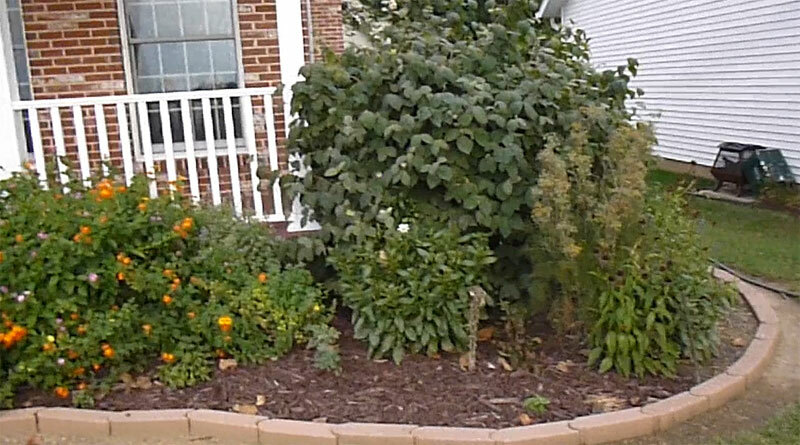 It’s getting outgrown by lantana in the back-side garden. Possibly put it where the Culvers Root used to be.